After I uploaded my last What I Ate Today video with the first glimpse of my Ayurvedic, Vata-pacifying diet, a viewer asked if I could recommend any books about Ayurveda and also any inspirational or self-improvement books. I wrote about the books that made the biggest impact on my life in the past. Today, it’s time to talk about the literary gems that have helped me unlock the secrets of the ancient art of Ayurveda. I’ve been interested in Ayurveda since I quit the Paleo diet and it’s been a great inward, self-discovery journey. After finding out I was predominantly Vata, closely followed by Pitta, I’ve been keeping Vata-pacifying guidelines in my mind, and if anything throws me out of balance, I can tell most of the times what it was and, most importantly, I know how to remedy the aftereffects. It’s all thanks to Ayurveda. Sharing my favourite books about Ayurveda with you is the least I can do to express my gratitude and appreciation of this ancient healing system. If you aren’t already interested in it, you should be! Let this list of recommended books be your guide that will take your hand and lead you gently into the Ayurveda world. Make yourself a cup of warm, spiced chai (paradoxically, did you know that drinking warm tea helps your body cool down? ), and let’s delve in! “Prakriti: Your Ayurvedic Constitution” was the most recent book about Ayurveda that got into my hands, but it quickly became my favourite. I found the constitution typing test to be the most accurate one out of all and I could relate to the descriptions of all the different types of prakriti perfectly. This book is the best one to start with if you’re completely new to Ayurveda, but it’s also excellent if your knowledge is already deeper. It’s not too technical, yet provides enough interesting details from the ancient Sanskrit texts. Some reviews on Amazon said that the writing style was a little particular, but I loved it. Dr. Svoboda writes as if he was talking to his reader. Five stars for this book from me. Absolutely worth a read. 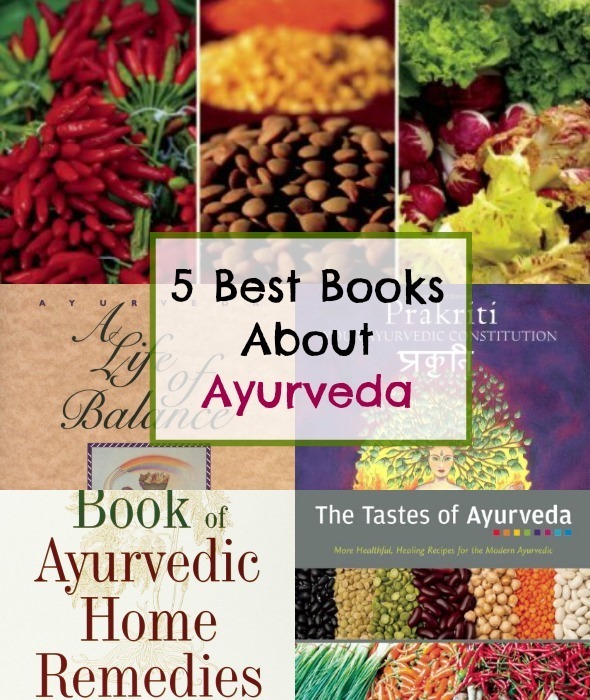 “The Complete Book of Ayurvedic Home Remedies” was the first book about Ayurveda that I read. It’s possibly the most extensive and detailed book out of all, but it’s also written in a very simple, straightforward way. It was very easy to read and enormously helpful. I chuckled when I started reading the descriptions of the different constitutions. It’s as if somebody was describing me. Scary, but fascinating at the same time how Ayurvedic practitioners knew more about us all these thousands of years ago than we do now. The book doesn’t have any recipes, but it has extensive food lists, breathing exercises, tips for meditation, yoga, etc. It’s really a complete guide for the Ayurvedic way of life. Vasant Lad also happens to be the most respected expert in the Ayurvedic field, so his voice was definitely one of the most trusted ones when I was searching for a book about Ayurveda for a start. “Ayurveda: A Life of Balance” was a pleasant surprise. I thought it was going to be just another book about Ayurveda, but it blew my mind. It’s written in such a beautiful way and it captured the essence of Ayurveda, the ancient healing system, better than any other book. I love how the author included so many beautiful details from the ancient Ayurvedic texts, for example, which goddesses each constitution should think of when meditating. I’m fascinated by foreign cultures, and when they’re ancient, they are a hundred times more interesting, so this book was perfect. Maya Tiwari turned to Ayurveda and self-healing after being diagnosed with terminal cancer. She healed herself by making peace with her roots and claiming her life back. It’s a truly inspirational story. I love this book because it gives separate food lists for mixed constitutions. Not many of us are true Vatas or true Pittas. Most of us are mixed. Sometimes we even have all three doshas out of balance. For this reason, “Ayurveda: A Life of Balance” is extremely valuable. I also enjoyed the chapter talking about traditional Ayurvedic food preparation methods – they have been completely forgotten in the modern world. Don’t miss the perfect daily routine for each constitution as well. It’s a great framework to start with. Perhaps my most favourite thing in the book is recipes. There are lots of them and they are very close to my heart. They are so easy to make wherever you are in the world. Ayurveda is delicious. Reading “The Modern Ayurvedic Cookbook” was the first time I encountered Ayurvedic recipes and it was also one of my first encounters with Indian food. In fact, it’s not only Indian foods. The author was born in Africa and now lives in the US, so the recipes are a mixture of traditional Indian, international, African – a beautiful, healthy fusion for anybody. Each recipe clearly indicates which doshas or constitutions it’s good for. The first time I tried recipes from the book, I made spelt chapatis and cilantro garlic chutney. My guests loved it! Chapatis have become a staple at my home since and I’ve been experimenting with lots of different varieties. Most recipes are pretty easy and ingredients can easily be found anywhere. It’s a great cookbook! “The Tastes of Ayurveda” is the second cookbook from the same amazing Amrita Sondhi. If you like the first one, you’ll love this one, too. The recipes are equally healthful, delicious, beautiful, and easy to make. I’m a huge fan of experimenting with different cuisines from all over the world and “The Tastes of Ayurveda” is a great recource for that. These are all the books about Ayurveda that I wanted to recommend. If you get any of these, let me know what you think. What are your favourite resources for Ayurveda? Ayurvedic therapies work to heal and balance the body without disturbing a person’s natural intelligence. Thx Vita. That last cookbook is so BEAUTIFUL! I wish there were more books that carried the principles of Ayurveda over to more Western foods and herbs. The principles don’t disappear just because different plants grow here, but not many people have really transferred the principles to our Western resources (resource-wise). I do have a book called Planetary Herbology, though, that I’m looking forward to reading, which does just that. I also have The Yoga of Herbs, which is a pretty interesting herbal reference. Nice article. I found your article after searching a lot on google about Ayurvedic books. Amidst all searches I found your article to be simple and best. I am going to purchase a book as I feel it is time for me to move to Ayurveda. Both as a lifestyle and for cooking. However, I am so confused as all books you mentioned are equally amazing. If I am to look for a book which has a combination of Ayurvedic lifestyle and recipes for cooking, which one would you recommend?